Last episode saw the Germans join into the fray on the Italian front. They joined the Austrians to launch an attack that would be named the Battle of Caporetto. After firing their artillery, a good number of which were gas shells, the combined Austrian and German army attacked. In response to this the Italian army, mostly just fell apart. This episode we will pick up that story and carry it to its conclusion. We begin by looking at the overall Italian response to the attack and how it did not really help slow the advance that was happening. We will then continue to see how the Italian army continued to fall apart for the rest of October 1917. Everything could eventually come to an end though and after we discuss how the attack ran out of steam we will look at the aftermath of this, the greatest battle on the Italian front. One consequence of this disaster would be the replacement of Cadorna, who had been the Supreme Leader of the Italian army since the very beginning. We will end this episode by looking ahead to 1918 and how Caporetto would affect both armies for the rest of 1917 and really until the next of the war. After this episode we will leave the Italian front for the time being, we have other business to attend to, something about a revolution and a guy named Lenin. After the attack started it took a bit of time for information on the attack to filter back to headquarters. After the attack begun real information did not begin to arrive until hours after due to the confused situation at the front. By mid-day all that headquarters really knew was that Capello's army had been attacked by a force out of Tolmein, which was not much to go on, then over the course of the afternoon the information that arrived was scare and confusing. The picture that began to develop was that the Austrians had began to occupy the hills to the west of Tolmein. One of the biggest issues when it came to trying to put together some sort of picture was that getting information from divisions that were collapsing and retreating was very difficult. The reserve units were also falling apart at an alarming rate, making it difficult to maintain any kind of communication infrastructure. At the end of the day a picture began to form and it made concerns at headquarters skyrocket. After consulting with his staff Cadorna defined three new defensive lines all to the west of the Isonzo that the army could retreat back to if needed. All of these lines would prove to be far too optimistic for where the Italian army would be able to stand and fight. With such a disorganized army, and one that was being hit hard at very specific points on its front mass confusion in critical areas was the rule and not the exception. Because of this confusion there was simply no way to arrest the retreat in time to make these three areas a viable position. Often the units that could create these positions, those that were still sticking together and under control would arrive at the front in time to hear that on some other point of the front the enemies had already penetrated far enough to make their efforts worthless and they were then forced to retreat as well. During the next morning the situation continued to deteriorate, and this news began to come back to headquarters in more coherent groups of information. Unfortunately, the more information that was received the larger and larger the disaster began to appear. Units were falling apart, morale collapsing, and thousands of men were making their way to the rear as fast as their feet could carry them. In the north the advance continued, and the collapse was making its way south with the troops on the middle Isonzo now in jeopardy. On the Carso the Duke of Aosta was already preparing to move his troops back, even without an order coming from headquarters to do so. His heavy batteries were by this point already on their way westward. He would be the one to telegraph the government in Rome that "Losses are very heavy. Around ten regiments have surrendered without fighting. A disaster is looming, I shall resist to the last." however before this message arrived the government, already on precarious footing and with news trickling back about what was happening had been dissolved after losing a vote of confidence 314 to 96. Without any real way to control the chaos all that Cadorna and his staff could do was to put their hopes in the men and officers at the front. Unfortunately, the officers closer to the front had just as little of an idea about what to do as the men on Cadorna's staff, and the number one priority of the rank and file was to simply get away and save themselves. Right from the very start large units of the Italian second army were beginning to just abandon their weapons and equipment to speed their retreat. What initially started as a result of the attacks quickly began to spread as units, instead of retreating out of pressure from the enemy started to retreat out of fear of being cut off and surrounded. This type of behavior would begin to snowball. It was often the troops in the second and reserve lines that would spread this type of panic the fastest as they came in contact with other units behind the front. One catalyst for this panic, and why it spread so widely, were instances where the Italian units met the enemy in areas that they were not expected to be in. The panic was spreading, and for the men of the Second Army without real orders or a plan that was communicated to them there was nothing to slow it. After the war there was a commission to investigate what had happened at Caporetto. During on the hearings a soldier, who at the time of the battle was a captain, would report that one of the reasons that men were fleeing from the front was not because they were afraid but instead because they believed that the war was now over, and they could go home. ‘Then we’re going too,’ someone said, and we all shouted ‘That’s right, we have had enough of the war, we’re going home.’ The lieutenant said ‘You’ve gone mad, I’ll shoot you’, but we took his pistol away. We threw our rifles away and started marching to the rear. Soldiers were pouring along the other paths and we told them all we were going home and they should come with us and throw their guns away. I was worried at first, but then I thought I had nothing to lose, I’d have been killed if I’d stayed in the trenches and anything was better than that. And then I felt so angry because I’d put up with everything like a slave till now, I’d never even thought of getting away. But I was happy too, we were all happy, all saying ‘it’s home or prison, but no more war’. In other areas the soldiers threw down their arms and claimed "The war’s over! We’re going home! Up with the Pope! Up with Russia!" Those men not behind the front were often captured. As I mentioned last episode that sometimes these men were almost searching out a way to surrender and needed only the lightest nudge to make it happen. In one specific instance 150 German troops convinced 2,000 Italians to surrender. Many of these prisoners would be marched as units back to Caporetto where they would be interned until after the battle. As item of note in this case is that there were very few stories of any prisoners being mistreated. Cadorna would write to his son at around this point that "The men are not fighting. That’s the situation, and plainly a disaster is imminent . . . Do not worry about me, my conscience is wholly clean . . . I am very calm indeed and too proud to be affected by anything that anybody can say. I shall go and live somewhere far away and not ask anything of anyone" As the fighting continued the weather remained perfect, the Germans and Austrians at the front were in high spirits and in front of them was mostly just masses of Italian troops crowding the roads, tossing their weapons aside, and doing a bit of light looting on their way as well. Things were looking fantastic for the attackers. On the 28th the headlong retreat, or advance depending on how you look at it, continued. The 3rd Army on the Carso was now also in full retreat since that was the only way to keep it from being surrounded. Late in the day the Austrians crossed into Italy proper and the Austrian military put out a bulletin that said "After five days of fighting, all the territory was reconquered that the enemy had laboriously taken in eleven bloody battles, paying for every square kilometre with the lives of 5,400 men." On the other side of the line Cadorna released his own bulletin on the 28th and it was…well…just listen. "The inadequate resistance of the units of II Army, cowardly retreating without fighting or ignominiously surrendering to the enemy, has permitted the Austro-German armed forces to break our left wing on the Julian front. The valorous effort of other troops has not succeeded in preventing the enemy from penetrating the sacred territory of the Fatherland" Those are some pretty harsh words, and the enemy would use them to its advantage. On the very next day German and Austrian planes started dropping leaflets quoting Cadorna's bulletin and saying "This is how he repays your valour! You have shed your blood in so many battles, your enemy will always respect you . . . It is your own generalissimo who dishonours and insults you, simply to excuse himself!" They were definitely trying to take advantage of the situation. This did not necessarily speed up the retreat of the 2nd Army, but they were pretty much already going as fast as they could anyway. The next Italian hope for a pause in the retreat was at the Tagliamento river. The Austrian troops were moving to the river as fast as they could because they knew that if they could get to the river, and get across it, before the Italians had a chance to blow the bridges then the advance could continue. On November the 2nd they were able to get part way across, onto an island in the middle of the river on the northern flank of the attack. However the Italians were able to blow the bridge to the other side trapping the Austrians in the middle, at least for a few days. The Italian engineers had done a rush job on the demolitions and the bridge was not completely destroyed and was quickly repaired. As soon as the Austrians had made it across the river the advance began again. The Germans were still not sure how far they wanted to push the attack. 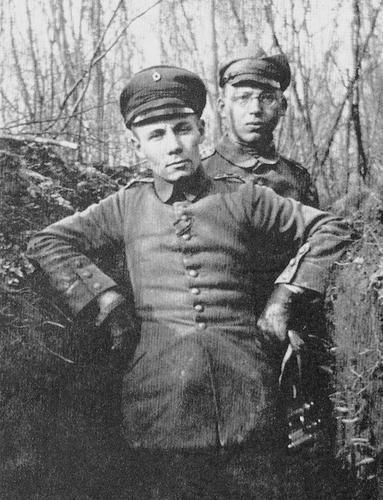 In what Piero Pieri, an Italian historian, would call a serious lack of "annihilating mentality" Ludendorff, von Below, and the other German leaders were not sure how far they wanted to push the attack. There was some talk of trying to push all the way to the River Brenta, which would have also meant the capture of Venice. There were also other discussions about attacking out of the Asiago and Trentino to cut off the Italian retreat. Neither of these would happen though due to the hesitancy of the Germans to push forward. It would not be until the second week of November that Ludendorff would change his mind and change the objective to the Brenta, but by then it was too late and the line had solidified on the Piave. This was a boon for Cadorna, and the hesitancy allowed him to extract the Third Army from the Carso mostly intact, or as intact as it could be given the situation. However, while the third army would mostly survive, Cadorna was about to find himself out of a job. The path to Cadorna being relieved of command began on October 28th. It was on that day that the British representatives in Italy stated that they would be willing to commit some troops to help the Italians, and that they trusted the Italian soldiers that they would be fighting beside, but they did not trust their commands. Then on November 5th the King called a meeting of all of the military and political leaders of the Western Alliance. Many high ranking members attended to discuss what should be done, but there was one very important person missing, Cadorna. The King was none too happy about this and called another meeting on November the 8ths where he would call for the resignations of both Cadorna and Capello. When Cadorna found out about this he got very, very, angry and continued to try to find anybody to blame but himself. At some point he ended up insulting the Royal House of Savoy, at which point the King simply dismissed him. It had been a long two years for the Italian army under Cadorna, but there was still a war to fight, and the show must go on. The French and British wanted the Duke of Aosta to replace Cadorna, he was a reasonable candidate having led the army on the Carso for most of the war. However there was a small issue of animosity between the King and his cousin the Duke. The problem revolved around the fact that the Duke was apparently a bit taller and quite a bit more handsome than the King and because of this the King instead chose General Armando Diaz, a 57 year old soldier who had risen up through the ranks during his lengthy military service. When he accepted the position he said that he was doing his sacred duty but that "You are ordering me to fight with a broken sword. Very well, we shall fight all the same." Diaz would not prove to be a brilliant strategist or leader, he would not really do anything fantastic and amazing, but he would also not make any real mistakes. He was a cautious leader and a steady hand, which is exactly what the Italian army needed after the battle of Caporetto. Seeing the situation at the front, he decided that the army would continue its retreat to the River Piave, and there they would finally put an end to the retreat. The Piave was in part chosen because it would be the last chance for the Italians to stop the attack before it hit Venice. It was 150 kilometers to the west of the Isonzo which on the bright side meant that the Italian lines were much shorter after they arrived. It basically allowed them to half the length of their line which meant that the 2nd Army, as shattered as it was could be taken out of the line completely to be replaced by the 3rd army which was fresh from its retreat away from the Carso. This worked out very well for the Italians and it allowed them to put reasonably fresh troops into the line just as the Austrians and Germans were beginning to run out of steam. They had now completely outraced their ability to resupply the frontline troops, a common probably we have discussed several times before. They would reach the river but go no further. The northern anchor of this line was Monte Grappa which would see a good portion of the fighting near the end of the Caporetto attack and during early 1918. If you have played the recent Battlefield 1 game one of the multiplayer maps takes place on the mountain, its also a very good map if I do say so myself. Here the Italians and Austrians would strive to gain control but in the end the Italians would put around 50,000 men in the line of defense around the mountain, preventing the Austrians from gaining much ground. 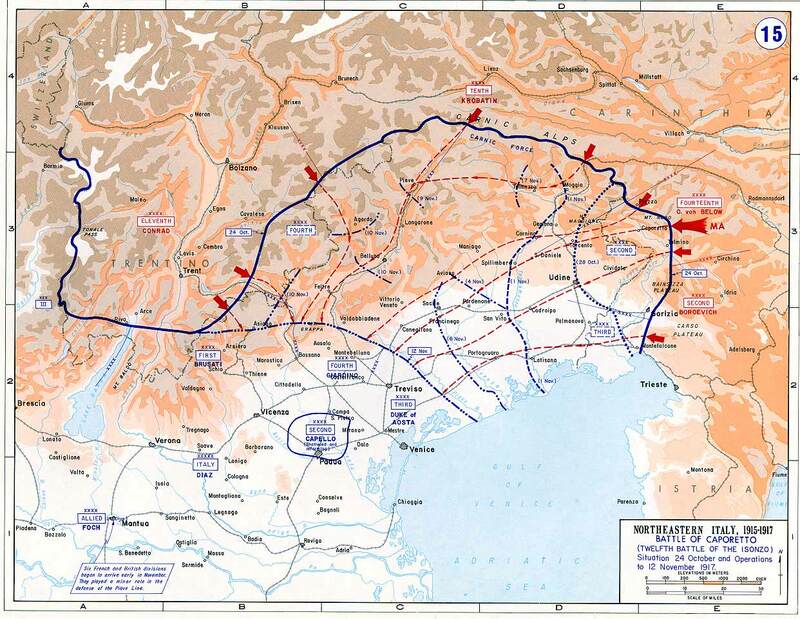 On November 16th the Austrians would try to restart the attack by moving across the Piave but they failed. After this attempt the attack sort of just ended. The Italians had been driven back, the 2nd Army had been shattered, but it was over. Over the course of the entire attack almost half of the Italian Armies 65 divisions became combat ineffective. 12,000 men were dead, 30,000 wounded and almost 300,00 0 had been captured. Then there were also 350,000 that simply deserted during the rout, many of which were still wandering the countryside, often trying to make their way home, after the battle ended. More than 3,000 artillery guns, 300,000 rifles, 3,000 machine guns, and a countless number of other supplies had fallen into Austrian and German hands. This does not even count the 14,000 square kilometers of territory. On the Austrian and German side they suffered only about 70,000 casualties. Obviously that is quite a bit lower than the total Italian casualties when you include prisoners. However I think it is still worth nothing that even though they were doing so well the Germans and Austrians still suffered more dead and wounded than the Italians, but an almost 2 to 1 margin. Now this was effected by the number of men surrendering, reducing the dead and wounded, however I still bring it up because it is interesting to compare this situation and the numbers of the Spring 1918 offensive. When you look at both examples it becomes clear that the Germans had figured out a way, through assault troops, to gain a lot of territory, but it came at the cost of a shocking number of casualties. And when they met armies on the Western Front that would still at least sort of maintain their composure the casualties would be even worse. After the complete chaos of late October the Battle of Caporetto was now over, and the Italians now had a chance to take a breath and take stock. On the home front such a disaster, instead of causing problems, created a unifying effect. The enemy was now at the gates of Venice after all, the Italian army was no longer trying to capture a few hills in the Alps north of Trieste, or trying to gain a bit of territory to the north, instead they were defending Venice, Venice. The Italian Army was also done for the rest of the year, and it would only be in late 1918 that they would be prepared to launch another attack. Even when they did launch that attack it would only be possible due to the help of a large British contingent of troops and aid from America. Caporetto itself would become synonymous with great defeats in Italian culture for decades. On the other side the Austrians and Germans were feeling triumphal. The Austrians, with some German help of course, had managed to strike a massive blow against the Italians. They were now on Italian soil, they were striking right into the heart of Italy, on the gates of Venice. Unfortunately, this would be their final haymaker of the war, and the enemy was not knocked out. So while the line had moved far to the West, the situation on the Italian front for both armies looked much the same at the end of 1917 as it had at the end of the previous years of fighting. Both sides were completely and totally exhausted from the year of fighting, both sides had suffered horrible casualties, the question became could either side now pick up the pieces once again to go at it again in the spring? We will answer this question the next time we visit the Italian Front.